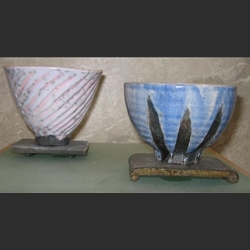 Each of the Bowl and Base Sets A, Left Side and Right Side, is a custom order, made by hand from clay and raku fired by Sara Mills. A waiting period of one month is usually needed for the artist to create a work closely resembling these images. Please inquire about similar pieces that currently may be available. These lovely bowls must be thoroughly washed by hand and air dried between uses.